The bar chart below illustrated the changes of the price in overall accommodation prices in five different cities in two time periods: 1990 to 1995, 1996 to 2002. Overall, the prices were growing up in those five cities. According to the bar chart, Madrid and Frankfurt both had increases in the two periods. The first period, Madrid and Frankfurt increases above 1 % and 2% separately. The second period, they increased approximately 4 % and 1% respectively. Turning to London and New York, These two cities had a drop at the first period and rose in the second period. New York declined 5% at average house prices between 1990 and 1995. At the same time, London dropped about 7%. 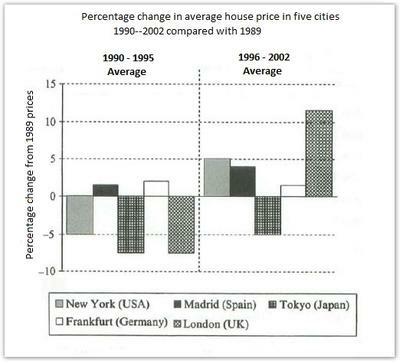 However, New York rose 5% and London increased about 12% of the prices from 1995 to 2002. Lastly, the average prices of houses in Tokyo were continuously decreased in both periods. The prices dropped 7% and 5 % in the first and the second period. Please comment below on this bar chart in order to help this student improve their IELTS score. The topic sentence was not clearly mentioned. No proper rephrasing of the title. It would be better to use complex sentences.